Everyone’s got at least one person who’s simply impossible to shop for when the holiday season gift-giving rolls around. Is that you, perhaps? Although we can all agree that it’s the thought that counts, some gifts are more equal than other gifts. 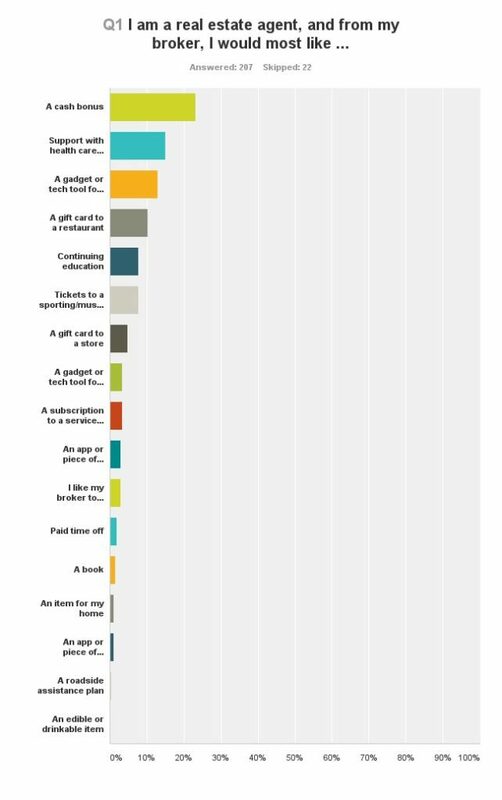 Inman surveyed readers to ask what you want for Christmas. We compiled this guide based on the 229 responses collected between November 7 and 14, 2016, which helped us understand which types of gifts were most popular, and then did additional digging to find a few specific suggestions for each category. Here were some of the other answers that agents gave to this question. Big winner: Cash is king for agents. Big loser: Don’t think you’ll get off the hook with a bottle of wine or a fruitcake — agents want something at least a little more personalized. “Support with health care benefits” was the second most-popular response from agent survey respondents; 14.98 percent of them said they would most like this from their brokers for the holiday season. Some ancillary plans will let employers/employees add family members, too. Some respondents (1.93 percent) said they would like paid time off from their brokers. A less-popular item was roadside assistance — only 0.48 percent of respondents said they’d most like a roadside assistance plan. Where to get it: Talk to a benefits broker about ancillary and supplemental health insurance plans. Some benefits brokers specialize in small businesses with large independent contractor staff loads, and they might have (affordable) options you’ve never considered. Many car insurance plans offer roadside assistance — but typically you will find some of the best rates for value for roadside assistance at AAA. Your agents might not thank you for that discount plan if it only includes one free mile, for example, so make sure you are comparing value for cost. And if the agents in your office are craving some paid time off, perhaps it makes sense to earmark a portion of their commission splits to help them plan (and you pay) for it? Something to think about during business planning. More than one-tenth of respondents (13.04 percent) would most like their broker to pick them up some kind of business tool or gadget. Almost 8 percent (7.73 percent) said continuing education would be a welcome gift; 3.38 percent wanted a subscription to a service or publication; and 1.45 percent wanted a book. It’s hard to go wrong with a video stabilizer for the recording junkie on your list — there are numerous devices for iPhone and apps for Android that will help hold that camera steadier. If you’ve got a photographer on your hands, consider a lens for his or her smartphone camera. If the shutterbug in question prefers a point-and-shoot, memory cards, extra batteries or camera bags are other options. Mobile hotspots are making it easier and easier to untether yourself (and provide a measure of security above and beyond public Wi-Fi, too). Portable charging devices are another cheap but decent option for agents — we’ve all needed one when we didn’t have one. You can write a personal message in a real-deal book or give the gift of convenience with a downloadable version. Here are a few options for books for agents. As far as business apps go, picking up some gift cards to the Apple or Android app stores and handing them out can go a long way toward making your agents happy. 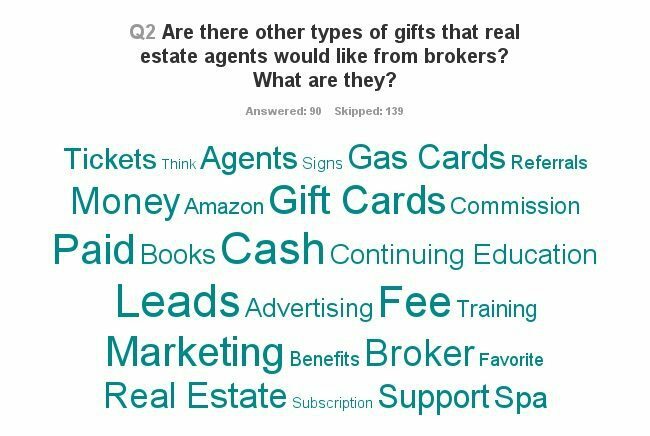 Some agents will be happy with more leads and additional training as possible gift options from brokers. One agent noted that “a one-on-one mentoring session with a top agent over lunch that was followed up with an office one-on-one” was the best real-estate related gift ever. “Waive a fee one time that we pay on a monthly basis and is included on our office invoice,” suggested one agent. Another wanted to see profit-sharing options — wouldn’t that make a nice gift? Customized for sale signs, or credit toward signs or other marketing materials. Do you have a coaching program for your agents? If not, might you consider purchasing a month’s worth of coaching for all the agents in your office? If you’re not already offering to subsidize some official continuing education (from the National Association of Realtors or your state or local association/MLS), then that could be something your agents appreciate. We’re not above a shameless plug: Did you know you can buy gift passes to Inman Connect New York (January 16-20 in New York City) and group or individual memberships to Inman Select? Now you do! A total of almost one-third (30.92 percent) of agent respondents wanted some kind of personal gift. Ten percent said they wanted a gift card to a restaurant, and almost 8 percent (7.73 percent) said they would most like tickets to a sporting/music or another cultural event. Agents also said that gift cards to a store or personal gadgets/tech tools would be welcome, and close to 3 percent (2.90 percent) said they wanted to be surprised. Less than 1 percent of agents (0.97 percent) said they wanted an item for their home. And no agent respondents said they wanted food or drink items. What to get? Your best bets seem to be gift cards to restaurants or admission to some kind of “experience” — and you’d know better than we would what’s available in your area. Big winner: Surprise! Agents said they most want their family and friends to surprise them with something thoughtful, and write-in responses suggest that can include time spent together. Big loser: Agents were less interested in asking their family and friends to invest in their businesses as a whole. Between the write-in responses and the survey results, it seems as though agents are most interested in spending time with their family and friends (especially if someone else is paying for and planning it) — and seeing what their loved ones surprise them with. 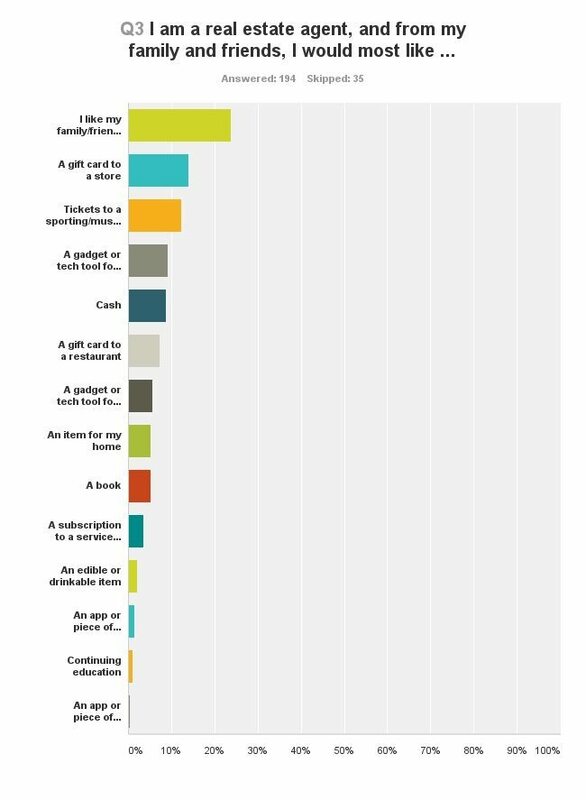 That said, tickets to sporting/music or cultural events or gadgets were also popular choices, so gift-givers in need of some surprise inspiration can look to those categories. Time spent together could range from something as small as a shared meal to something more involved, like a family vacation. One agent said that a weekend spent with each son would be a welcome gift. If you’re a consumer with an agent friend, then you might already know that your friend covets your referrals. If not: Your friend covets your referrals. About 5 percent of agents also wouldn’t mind something for the home — such as a Nest thermostat or possibly an Amazon Echo Dot. Homes are only getting smarter, after all! Should real estate agents take their kids to property showings?